The Globe reported today that Mel Gibson will be coming to Boston in August to film "Edge of Darkness" based on a 1985 police miniseries. I read about this project earlier in one of those gossip magazines (here) but didn't realize that they're going to be filming in Boston. Yay for tax credits. Mel Gibson will be in Boston in August to begin filming "Edge of Darkness," the Oscar winner's first starring role in a movie since 2002. 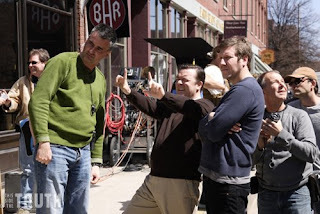 People working with the flick's financing producer, Graham King, have been in the area scouting for locations and crew to begin working on the film. "Edge of Darkness" also reunites Boston scribe William Monahan and King, who both won Oscars for their work on Martin Scorsese's "The Departed." Based on a 1985 miniseries, "Edge of Darkness" follows a by-the-book police investigator whose activist daughter is killed under mysterious circumstances. Hopefully this means all of you out there that have been trying to make it as an extra on one of the many projects here will get another chance. I'll keep my eye out for any casting calls and let you guys know as August approaches. 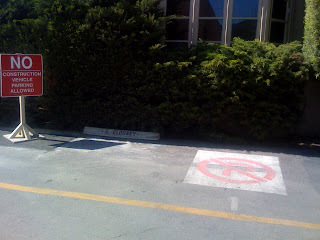 5/19/08 - Rumor has it that Mel Gibson wants to cast Britney Spears in the movie (here). 7/21/08 - A Roslindale couple who own a building there have turned down a proposal to use their site in the film because of the movie's affiliation with Mel Gibson (here). 7/31/08 - The Edge of Darkness casting call will be held on 8/2 (here). I'm relying on the collective knowledge of all you readers to solve this mystery. The last time I tried this, folks responded in less than 30 minutes to identify the mystery movie as "Bride Wars" (here). 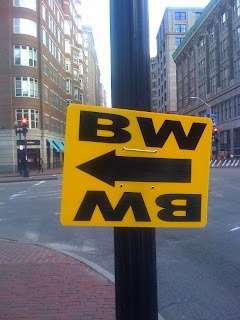 What is the "VSI" movie that is currently shooting in south boston? Right across the summer St. Bridge... Anyone know what it is? Anyone out there know what this might be? Whenever I see the letters "VS" together, all I can think of is Victoria's Secret. Yes, my mind is in the gutter. Thanks to Bloggery Reader Lyette. According to her findings, VSI = The Surrogates - Bruce Willis's movie. Why they're using the letters "VSI" I have no idea. Click (here) to go to the site that Lyette found. VSI stands for Virtual Self, Inc. this is the name of the company the creates the personal surrogates, android substitutes that let users interact with the world without ever leaving their homes. I received an email from an soon-to-be Emerson College student who's currently interning with a company that promotes horror movies. He informed me that there's a new French Horror Film called Frontier(s) that will be playing in limited release from May 9th-15th at Cleveland Circle. Personally, I'm not a fan of the genre. But I'm sure there are many of you out there that are. So those of you that saw Saw and Hostel and whatever the other popular horror movies are - you should check this one out. I watched the trailer and it looked pretty scary/gory. Click (here) to go to the movie's webpage for more info and the trailer. Based on some Googling, it appears that the movies going to be shown at the National Amusements: Circle Cinemas theater (here). Oh and a hilarious story of something you should NOT do. A buddy of mine took a girl out to see "The Ring" when it was out in theaters. Both of them were not the scary movie type. So after the movie they were both decently scared. After he dropped her off at her dorm room, he went back to his own room, borrowed his roomate's phone (so she couldn't recognize the caller id) and then called her and said "seven days" when she picked up. She wasn't amused. So my girlfriend left a few of those weekly celebrity gossip magazines in my apartment after her visit this weekend, so obviously I decided to leaf through them and see if our recent influx of movie stars has managed to get Boston into it's pages. Lo and behold a couple of small blurbs in each of the magazines that I looked at. In Touch Weekly had a picture of Sandra Bullock and Ryan Reynolds together from their work filming "The Proposal." More background info (here) from previous entries. 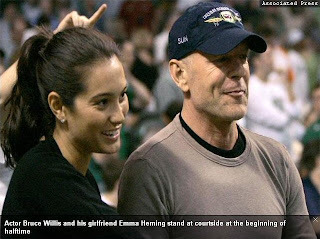 On April 12, the pair headed to Boston's Upper Crust Pizzeria where Wilson ordered a slice topped with Italian sausage. But then again, when you don't have any real news to report, you have to print whatever you can get. Us Weekly also reported that Wilson stayed at the Ritz during his visit. Ms. Hudson has been living there during her time in Boston. I say "worse than expected" in the title because "wayyyyyyyyyyy worse than expected" wouldn't fit. Holy cow, when I first read about the gas line being flooded in the Financial District & North End the articles reported that it'd be fixed in a matter of days. Residents and businesses in the Financial District and parts of the North End could suffer sporadic failures of gas service through the spring and possibly into summer and beyond, because it will take months for utility crews to remove all water trapped in gas lines by a weekend water-main break, officials said. Uhhh, that's insane. Not only are restaurants in the area unable to cook, but people who live in the area do not have heat or hot water. At least one building that I know of that is affected is The Devonshire. I was there yesterday and they confirmed - no heat or hot water. Not cool guys. How can an original estimate of a couple of days suddenly turn into a several months. Saying that the damage is worse than you thought is quite the understatement don't you think? I'm moving into that area in a month and half and I expect to be able to take a hot shower. The news just continues to get worse. Here's the latest from a Globe article today. While the bulk of the water has been removed, the complicated process of removing the remaining pockets of water could stretch into winter, meaning that customers will see periodic disruptions of gas service for the rest of the year. People are already bailing out of the area for lack of hot water, but the only saving grace is that it's warming up and we're in the midst of Spring. If these problems stretch into winter - people cannot survive without heat. Better start making contingency plans - that goes for tenants as well as landlords. Click (here) for the latest globe article. Hopefully most of you will get your ice cream fix today during the Ben & Jerry's free scoop day (here), but if you don't, Baskin Robbins is holding their 31 cent scoop day tomorrow - 4/30. Canton, Mass.-based Baskin-Robbins will hold 31 Cent Scoop Night on April 30 from 5 p.m. to 10 p.m. at all of its 2,700 stores, according to the company. During the event, the company, known for its long running branding platform touting its 31 flavors, will reduce the price of its 2.5 oz. ice cream scoops to 31 cents. For the event, Banskin-Robbins will partner with the National Fallen Firefighters Foundation and donate $100,000 to the organization. The two organizations will also honor 31 firefighters from across the country who have demonstrated an exemplary commitment to community service through the newly created America's 31 Firefighting Heroes program. I could really go for some cookies and cream right now. Click (here) for an article about the Baskin & Robbins event. "Open Book Club," a new monthly TV show hosted by actress Christy Scott Cashman and Debbie DiMasi, wife of the Massachusetts House speaker, debuts next weekend. Filming at Cashman's Back Bay home, the show premieres on NECN at 7:30 p.m. on May 4 and airs on the first Sunday of each month. The first episode includes Tom Perrotta, Sue Miller, and Andre Dubus III. Next month Cashman heads to the Cannes Film Festival for the premiere of Abel Ferrara 's new film, "Chelsea on the Rocks," in which Cashman is featured alongside the pic's stars Ethan Hawke, Dennis Hopper, and Bijou Phillips. Part of the lack of appeal for me is that I have no idea who either of the hostesses are. Apparently, Christy Scott Cashman is an actress who appeared in a bunch of movies that I haven't seen yet (here). And because I'm not into politics at all, I don't know anything about Debbie DiMasi or her husband Sal except for the recent controversy that has come up about the whole ticket scalping bill and unregistered lobbyist thing (here). Click (here) for the Globe blurb. Scroll down to the very bottom of the page. I went to see The Drowsy Chaperone this past weekend at the Opera House near Downtown Crossing and it was really entertaining. I had heard it was winning awards and what not when I bought tickets all those months ago, but didn't really know what to expect. Act one begins with The Man in Chair, a mousy, vaguely depressive Broadway fanatic whose coping mechanism involves listening repeatedly to a recording of a 1928 stage show, The Drowsy Chaperone. When he first turns on his phonograph and static breaks from the speakers, he wistfully tells the audience, "I love that sound. To me, that’s the sound of a time machine starting up." By the time the first note sails out of his speakers, he's been transported to a magical dream world, one where the actors in the recording enter his dingy apartment and transform it into a gloriously garish set. 1. Amy's mom from Everybody Loves Raymond is in it. 2. Tapdancing synchronized to music - never seen that before. 3. An actor that looks like the spitting image of Mike Ditka. The thought of Mike Ditka singing is hilarious to me. 4. Someone rollerskating while blindfolded. I think overall, Wicked is still my favorite one - it definitely had the highest production value out of anything I've seen. But then again, this is only the fourth musical I've seen in my lifetime. If you guys get a get a chance - see The Drowsy Chaperone. It was a little bit on the cheesy side, but I still enjoyed it. The performers in this show were definitely really talented. Click (here) for a video interview of Georgia Engel (Amy's Mom) about her role in the musical. Click (here) to see if you can score some tickets to the show. PS. Use the restroom prior to the show because there is no intermission. I learned that the hard way. Luckily the show is pretty short - just under two hours. Jazz Week aims to stimulate widespread interest in jazz while developing audiences, to highlight the vibrant jazz scene that exists in Boston while focusing on our many talented resident musicians, and to build Boston's reputation as an important jazz city while nurturing the Boston jazz community. All of this is an expression of JazzBoston's mission to spread the word about Boston's thriving jazz scene and keep it growing. There's going to be events all over Boston and the surrounding suburbs. My pick? I have a pretty packed weekend already, but I'm leaning towards a jazz brunch on Sunday at one of the hotels downtown - either the Langham or the Four Seasons. Yum. Click (here) to see a full schedule of events. Found at the corner of Boylston & Arlington. The arrow is pointing south on Arlington. 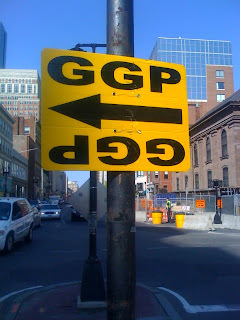 For those of you that are movie filming fans - follow the arrows. Eventually you'll find the set. And if anyone does find the set, I'd greatly appreciate if you could leave a comment with specifics. 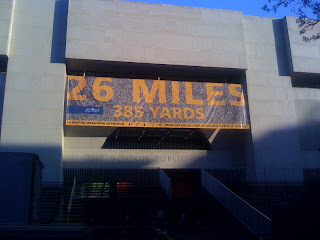 Unfortunately, I the pesky day job prevents me from wandering the city during business hours. Remember the story about the NYC construction worker that tried to "curse" the yankees by burying a David Ortiz jersey at the site of the new Yankees stadium (here)? Well, the jersey was subsequently donated to the Jimmy Fund and auctioned off for charity. The auction came and went and the president of a car dealership in MA won the jersey for $175,100. Kevin Meehan, of Mendon, bid $175,100 just 18 seconds before the eBay auction ended, becoming the last of 282 bids placed. All of the proceeds will support the Jimmy Fund’s adult and pediatric cancer care and research. Click (here) to see the Ebay auction for the jersey. Click (here) to read more about the final sale. But for those of you that are faithful readers of this blog, you also know that he's in town to start filming his movie: The Surrogates (here) for which some of you went to the casting call (here). I spotted Bruce Willis and his girlfriend enjoying a leisurely stroll through the public garden while I was on my lunch break today. They seemed to be enjoying themselves and no one around me noticed it was them. I wasn't about to ask for an autograph because I didn't want to ruin their time by drawing attention to them. Thanks for the update Erica! I wonder if they're staying close by the Public Garden. Possibly at the Ritz or the Four Seasons? Do you guys remember back in January when Adriana Lima was at the Natick Collection? According to the comments that folks left, the place was a zoo (here). Well, get ready for a repeat session. And I'm guessing it'll be even crazier this time since the weather has gotten nice and folks are going to be in the shopping mood. To kick off the arrival of the new Swim 2008 collection in stores, Victoria’s Secret is celebrating Friday, April 25, with a day of supermodel sightings, free gifts, and beach beauty makeovers. Meet supermodel Marisa Miller and get her autograph from 5-7 p.m. While you’re there, get free tips and demonstrations on how to look like a beach babe by Victoria’s Secret makeup artist Linda Hay. The event is going to be taking place at the Victoria's Secret at the Natick Collection. Sorry guys, according to wikipedia, she's already married (here). Who knew there were contests for this kind of stuff. But then again, now I am kind of curious to drive down to Southampton and try their water. A panel of judges at the Great American Water Taste Test has decided that Southampton has the best-tasting drinking water in the country. The contest is held each year on Earth Day during a meeting of the National Rural Water Association in Washington. Using the same standards as wine testers, the judges sampled drinking water entries from 39 states for bouquet, clarity and taste. Southampton Water Superintendent Joseph Slattery told the Republican newspaper of Springfield that he personally drew the sample from a town well that draws water from the Barnes Aquifer. He said the water is so clean and natural it doesn't even have to be treated. Eeek, I take that back. I just googlemapped it and it's 100 miles away. At today's gas prices coupled with the fact that I drive a gas guzzler - the trip would probably cost me $200 in gas for a free glass of water. And before anyone gives me crap for driving an SUV. I walk to work - I only drive it about once a week to do grocery shopping and such. The Independent Film Festival of Boston starts today and is kicking off the week long event with a screening of "Transsiberian" a film staring Sir Ben Kingsley - speaking of which Mr. Kingsley will be in attendance tonight. Here we are, burning the midnight oil getting ready for our Opening Night screening of TRANSSIBERIAN. We knew that Director Brad Anderson, Writer Will Conroy, and Producers Todd Dagres and Michael Williams would be in attendance, but we have finally gotten confirmation that Oscar-winner Sir Ben Kingsley will be in attendance tonight at the Somerville Theatre in Davis Square and we are thrilled. The screening starts at 7:30pm, but the outside box office window will be opening at 5pm at the Somerville Theatre in Davis Square. You'll probably need to go super early if you want to get a ticket. Also, considering there are so many movie stars in town filming movies lately, maybe some of them will show up at some point to catch a film. Click (here) for the IFF Bostonwebsite. I tried on a pair of True Religion jeans once. I was at a Bloomingdale's. They looked like any other pair of jeans. I was unimpressed. I still can't fathom the idea of paying $200 for jeans. True Religion Apparel, Inc. announced the lease signing of a new branded store in Boston's prestigious Back Bay neighborhood. 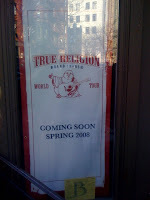 Located at 119 Newbury Street, between Clarendon and Dartmouth Street, the 1,984 square-foot branded store will offer shoppers the entire True Religion collection for men, women and kids, including its signature denim, expanding sportswear, and a full range of licensed product, such as footwear, swimwear, headwear and handbags. The store is expected to open in Spring 2008. Click (here) to read the press release. Simon Doonan is the bestselling author of Wacky Chicks and Confessions of a Window Dresser. In addition to his role as creative director of Barneys New York, Simon writes the "Simon Says" column for The New York Observer. He frequently contributes observations and opinions to myriad other publications and television shows. He is a regular commentator on VH1, the Trio network, and Full Frontal Fashion. He lives in New York City with his partner, Jonathan Adler, and his Norwich terrier, Liberace. Click (here) for a link to his personal website and scheduled appearances. Many thanks to Bloggery Reader Kaitlin for sending this to me. They're filming the Kevin James comedy at the Burlington Mall. I apologize because I'm many days late in posting this, but let's hope they're still filming. Just thought I'd let you know that if you're at the Burlington Mall, there is a really good chance you can see Kevin James if you hang out by the mall entrance of Macy's and FYE. The people that work in FYE said that Kevin James' scenes have all been shot there for the entire week, and that sometimes they and their customers are asked to hold completely still while filming! Craziness. 5/11/08 - Mall Cop Filming move to the South Shore Plaza. Also spoiler alert regarding the ending of the movie (here). I was walking around downtown this past weekend. Quick side note, I've been going to Charlie's Sandwich Shoppe religiously for breakfast on the weekends - it really is fantastic (here). After eating a deliciously greasy breakfast, I then proceed to walk around downtown for a few hours to see what's new in town and just enjoy the overall nice weather and sunlight. I was walking down Boylston this past weekend and noticed some folks working on putting up a new sign where the Foggy Goggle used to be. I thought "Cool, a new bar," and kept walking. 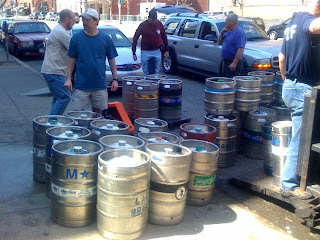 Now in 2008, Casey and the Murphys have resurrected “McGreevy’s 3rd Base Saloon” in the heart of the city of Boston. The result is an unmatched Irish Pub and sports bar experience where any member of Red Sox Nation can take a step back in time to see where it all began and rub elbows with current Sox stars like Papelbon himself. Featuring an exact replica of McGreevy’s original barroom it features actual photographs and baseball treasures that hung on the walls of the original watering hole. Come join us for a special one day sneak peak on Marathon Monday (the race goes right by us) after which we will close for a few weeks to finish renovations followed by a May GRAND opening! Sorry guys, I'm a day late in discovering this so we missed the sneak peek. But stay tuned for the Grand Opening in May, it should be a great new place to hang out. Click (here) for a link to the rest of the news release. As you may know, Sandra Bullock is in town filming The Proposal (here). She and her husband were involved in a head on collision Friday night - but rest easy - everyone is ok.
No one was injured, but police said both cars were towed and a Gloucester woman was arrested and charged with driving under the influence and failure to stay in marked lanes. The Globe reported that Ms. Bullock was really nice about the whole situation and was consoling the drunk driver after the incident - which I find to be great. She always plays a nice person in movies, it's good to know that she's the same way in real life. The strangest thing about the article, was the built in advertisement for some restaurant in the area. Check out this excerpt and let me know if it's just me or if this writer was just writing words cause he had a quota to fill. Bullock's car was going about 15 to 20 miles per hour and tried to move out of the way, but the Subaru crashed into them, startling patrons dining nearby at Duckworth's Bistrot, which serves raw oysters, New York strip steaks, and $80 bottles of wine. Did I really need to know what they serve at the restaurant? How is that salient to the story at hand? St-Germain liqueur is made from the Elderflower, a blossom of the Elder Tree, picked fresh from the Alps. There's a very cute story on their website about how the flowers only blossom for a few days and they have them handpicked by bohemians on bicycles and so on and so forth. Here's the fun part. DailyCandy is running a promotion that allows you to send your friends semi-risque e-card invitations to bars in Boston serving St Germains and according to the site, the first St Germain Cocktail is free. Click (here) to go to the invitation site. There are only two bars in Boston participating in this event: B Side Lounge and Match. Click (here) to go to the St. Germain website if you'd like to read more. Man, I need to invent a new kind of liquor made from something exotic, like orchids from Singapore or something. Yum....orchid flavored liquor. 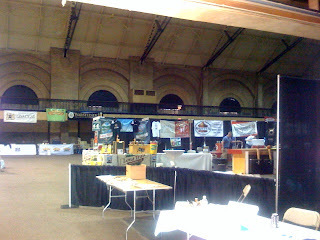 This is what the Beer Summit looks like "Before." 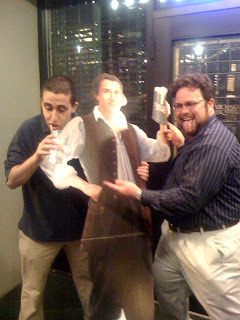 You don't want to see the "After"
Anyone see Sam Adams roaming around downtown on Saturday night with these 2 guys? Who would have thought it would be so hard to get into bars while holding a lifesize cardboard cutout of Sam Adams. According to the Globe, both Terry Francona and Michael Holley will be at the Barnes and Nobles at the Prudential Center this upcoming Monday 4/21 at 6pm to do a book signing. Michael Holley is coming out with a new book called "Red Sox Rule: Terry Francona & Boston's Rise To Dominance." A couple of additional things. First, the website doesn't mention that Terry Francona will be there, but the Globe ad does. Secondly, there is a disclaimer in the Globe that reads "Terry Francona and Michael Holley will sign Red Sox Rule only. No other books or memorabilia, please." Click (here) for a link to the Barnes and Nobles event page. One of my all time favorite comedy performances was Chris Rock's Bigger and Blacker. It was a classic - I can't count on my hands how many times I've watched it. Chris Rock is coming to Boston on June 14th at the Citi Wang Center and I bet it's going to be awesome. Tickets go on sale tomorrow - Saturday 4/19 at 10am EST. And just so you know, you will be competing with me to get tickets. I definitely can't/won't pass up a chance to see him in person. Let's just hope I can wake up before 10am tomorrow. "You don't need no gun control. You know what you need? We need some bullet control. Man, we need to control the bullets, that's right. I think all bullets should cost $5000. $5000 for a bullet. You know why? 'Cause if a bullet costs $5000, there'd be no more innocent bystanders." Click (here) for the link to Livenation. Show of hands, who knows who Gordon Brown is? I'm a little embarrassed to admit it, but his name didn't really strike a bell when I saw it. Margaret Thatcher - yes. Tony Blair - yes. Gordon Brown - not so much. Sorry dude. Anyhoo, the British Prime Minister - Gordon Brown - will be in Boston tomorrow at the John F. Kennedy Presidential Library and Museum to give a speech on foreign policy, the economy, international financial topics, etc. Brown will visit the United States for several days, making stops in New York, Washington, and Boston, said Joseph Pickerill, an official at the British consulate in Boston. I believe the library is going to be closed to the public - anyone know how you get an invite to this event? Anyhoo, here's a link to the blurb in the Globe (here) and also a link to a UK newspaper (here) talking about how it was probably a bit of a scheduling snafoo to have the Prime Minister and the Pope visiting the US at the same time. Happy Hump Day Everyone! 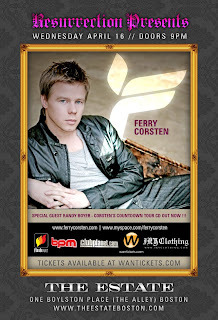 The title pretty much says it all - Ferry Corsten is going to be at The Estate tonight. So if you're in to trance music, it should be a good show. I'm more of a Tiesto or Armin Van Buuren kind of guy - I haven't really heard anything from Ferry Corsten lately, but he's got some big hits from back in the day. I was in Hong Kong on business last year sitting on a little fisherman's boat taking a tour around the Harbor with my boss and a business associate from HK. My boss (who's an avid boat guy) made a comment basically asking why all the boats in the marina were cheap/crappy boats. Our business associate replied that during the recession in HK during the late 90's and early 2000 everyone was forced to sell their luxury boats and now that the economy is just now recovering they've all decided to buy cheap ones instead because they lost a lot of $ when they had to sell the first time. Guess what? Now it's happening to us. There was a Globe article earlier this week about how everyone is getting rid of their boats because they can't afford them anymore. But for Eldoueihi and many other Massachusetts boaters this spring, that dream is on hold, that promise, no more. With gas prices soaring, the economy sputtering, and consumer confidence taking on water like a listing ship, boaters - especially middle-class boaters - are looking to unload their vessels in surprising numbers. His family, McCarthy said, is considering taking a $68,000 offer on his father's boat, even though that's about half the original asking price. "We're going to have to," he said. "Because with what we think is going to happen to fuel and the economy, it could get worse. And we'd hate to have it sell for $40,000." Just thought I'd post an email from Bloggery Reader Tory, who was kind enough to fill me in on her Bride Wars experience. Hello! Just to update you a bit since you were gone! 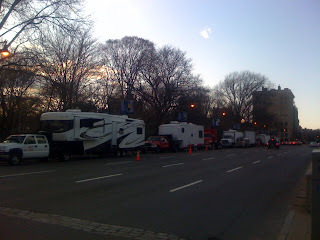 They have been filming the movie Bride Wars starring Kate Hudson and Anne Hathaway in the city for a little over a week. My friend cued me in on the set being near Newbury and so I sat on a bench near the trailers in the Public Gardens for about two hours last Monday. I was fortunate to see Anne Hathaway and have a lovely conversation with her as well as an autograph. She was so nice and down-to-earth. I also spotted Kate Hudson, and she has been seen with her son eating at The Paramount as well as Pizzeria Regina in the North End. They have also been shooting a lot of scenes with them jogging. Also, when I took a walk around the set near Newbury last week, they were closing down the set and lined all along the street were New York City taxis- I'm guessing the residence they were filming outside of is going to be portrayed as being in New York City instead of Boston :( I hope they don't do that with all of the movie! Show some Boston pride! Thanks so much, and I read your blog everyday! It's just another sign that if NY has more tax rebates, there's a good chance that we'll lose a lot of our movies. It'll be cheaper to film NYC in NYC as opposed to filming in Boston and pretending it's NYC. To Tory - Thanks very much for your email. 4/15 - I first see signs "BW" around the Public Garden and Bloggery readers help to identify the movie (here). 4/28 - Bride Wars call signs were seen outside the Langham Hotel (here). 5/13 - Bride Wars filming in The Alley (The Estate) - (here). 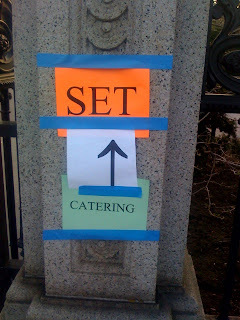 5/16 - Find out what scene they were filming at The Estate (here). Looks like New York is getting a bit jealous. First it was baseball, now they're getting upset that we're stealing all their movies. As a result, they're firing back with their own tax incentives. Envious of the Hub's improved relationship with Hollywood, New York Governor David Paterson is about to approve a budget that includes tax credits for filmmakers that are even more generous than the ones approved by Bay State lawmakers last year. While moviemakers are eligible for tax credits worth up to 25 percent of their payroll and production costs in Massachusetts, New York would give back 30 percent. Hopefully just being off by 5% makes us still competitive - it'd be a shame to see all the celebrities and filming disappear from Boston now that NY is lowering the limbo stick. What do you guys think? Click (here) to read the article in today's Globe. Maybe I'm losing my mind. Or perhaps it hasn't made its way back yet from vacation. But I cannot, for the life of me, think of a movie that's currently being filmed with the letters BW. There's Ghosts of Girlfriends Past, Ashecliffe, The Proposal, The Surrogates (soon), and the untitled Kevin James movie. What did I miss? Pictures were snapped yesterday around 6pm on Arlington and Charles Streets bounding the Public Garden. UPDATE: Wow, you guys are awesome!!! Within minutes of posting up these pictures, four of you already commented back with the name of the movie: Bride Wars - starring Anne Hathaway and Kate Hudson amongst others. Here's the plot outline from IMDB (here): Two best friends become rivals when they schedule their respective weddings on the same day. All the ruckus on Exeter Street in the Back Bay on Friday and Saturday was to film a scene for "The Ghosts of Girlfriends Past" in which Michael Douglas gets slapped for making advances at women at a nightclub. The crew took over Brian Lesser's Saint nightclub and restaurant to shoot the scene. . . . Actor Owen Wilson, who had dated "Bride Wars" star Kate Hudson, was spotted in town over the weekend. . . . And over at the former Christmas Dove Shop in the Quincy Marketplace, "The Proposal" star Ryan Reynolds was able to avoid attracting attention as he filmed for the romantic comedy that also stars Sandra Bullock. In this collection of mostly uplifting stories, Berg explores the everyday challenges that women face. Whether teenaged or octogenarian, Berg's heroines brave the emotional landmines underlying domestic scenes (from holiday dinner parties to visiting family), navigate the slippery slope of constant dieting and address the process of aging. The title story features an unnamed, insouciant narrator who flees from a Weight Watchers meeting and allows herself to indulge her most fattening food cravings. I haven't read any of her books myself (I don't think I'm part of her target demographic) but for those of you that are, she'll be at the Barnes & Nobles in Framingham at 7pm tomorrow April 15th. Click (here) for details on her book reading/signing. A construction worker's bid to curse the New York Yankees by planting a Boston Red Sox jersey in their new stadium was foiled Sunday when the home team removed the offending shirt from its burial spot. On Saturday, construction workers who remembered the employee, Gino Castignoli, phoned in tips about the shirt's location. "We had anonymous people come tell us where it was, and we were able to find it," said Frank Gramarossa, a project executive with Turner Construction, the general contractor on the site. It took about five hours of drilling Saturday to locate the shirt under 2 feet of concrete, he said. That my friends is efficiency. Too bad for the Gino's failed curse. I'll just have to go back to poking my Yankees voodoo doll with knitting needles. I find this somewhat humorous. Everyone made such a big deal about Filene's basement leaving their famed Downtown Crossing site and now it looks like they're going to be coming back. A little more dressed up - but back in their original space. Filene's Basement will move into One Franklin -- the redeveloped home of the original Filene's basement -- March 2009, confirmed John B. Hynes III, president and CEO of Gale International LLC, one of the owners and the developer of the building. The legendary mark-down retailer will occupy its original yet renovated three basement floors, said Hynes. They're doing a pretty good job with the demolition right now. 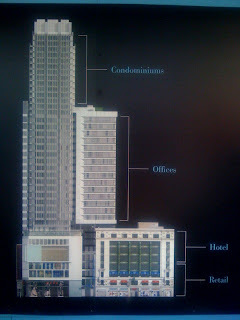 I can't wait to see how it turns out - especially since I'll be moving into the Downtown Crossing area soon. If you haven't ventured into the area lately, here's a rendition of what it's supposed to look like when it's done.